You will surely have had some kind of accident on your PC and you have lost important files that you didn't want to be deleted. 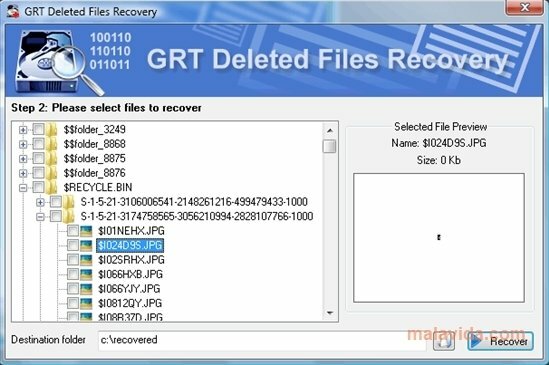 To solve the problem you can use a tool like GRT Recover Deleted Folder. It is a simple application that analyzes the system and that will allow you to recover the files that have been eliminated. 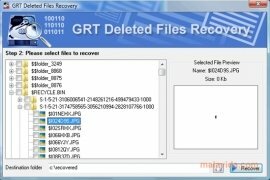 To use GRT Recover Deleted Folder it isn't necessary to have technical knowledge about data recovery, because the application will do all the work for you. When you launch the program, you will be able to see all the hard drives and the USB memory that you have connected to the system. You will have to select the one that you want to review, and GRT Recover Deleted Folder will locate all the eliminated files. After showing a list, you will have to choose those that you want to recover. This application, also known like GRT Deleted Files Recovery, it allows to recovery lost files from FAT16, FAT32 and NTFS hard drives. Download GRT Recover Deleted Folder now. The trial version can be used during a limited amount of time.